My website is back up and running! Hurrah for Dr Wicked and his Mad Scientist Web Skills! It's no fun being sightless in this world, I was lost and adrift in a sea of, well, no web site. I think I twittered this, but never blogged it. 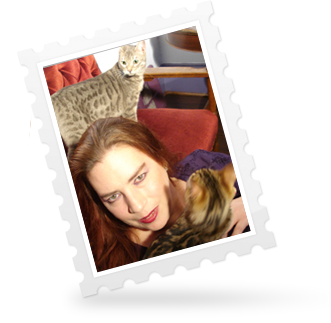 I bought the Bengals, Venus and Mim anyway, Little Coats, for going outside. (they were only ones I thought I had a chance of getting into the things with out having to go to hospital for stitches) There is a special Hell for people who buy their cats Little Coats, but they really like going out, and I didn't want them to be cold. Anyway, I love this whole Dr Who thing, and I need a Tardis. Not a REAL Tardis mind you, just a wee small one. To go in the Spooky House. I loved the way it flew around in last nights episode. I think I need one. To you know, kind of fly around in the Spooky House. Hey! I haven't seen most of them! I'm listening to Christmas music - intentionally - for the first time this year, and eating, I mean packing the holiday fruit&nut gift boxes. Yay! You're back up! Hope you have fun riding tomorrow and looking forward to more fabulousness! Oh, IA is looking great! Once you get all the way through Doctor Who, you need to watch Torchwood. Need. To. gift boxes sound like fun. the kitty coats are cute. i miss so much on twitter as i really only glance once in a while and catch what's on the screen at that time. i also liked both doctors. different but both so...doctory. So... how much does Mim hate her coat? Part of me is cringing that you put coats on your cats, but given the freezey weather I'd probably do the same. Our regular holiday present for family is a mix of fancy dried fruit and nuts from nutsonline.com (too lazy for link, sorry). Everyone enjoys it, it's fun to put together, though you'd think that if I did it every year I could manage to do so BEFORE the last minute. The dog and the cat are snuggled up together on the couch. This is a first - apparently it only takes 9 years for them to become buddies. Yay! We have our Lorraine back! The Web was lonely without you. i'm guessing sircinch is for gentlemen who like to look slimmer in the midsection...lol. it looks like a smaller saddle that puts the pressure and straps at a stronger point on the horse shoulder. regular saddles go more around the belly, yes? IA is really rather beautiful. Lorraine, the coat is adorable! Also, the feral rescue kitten I got from Beth Hommel looks like your kitty. (Which is slightly odd. :D ) However, and I tweeted that you should get one for Maddy, but...if you really need one - http://www.entertainmentearth.com/prodinfo.asp?number=UT01620 Tardis Bank or, (I have this, it's awesome,) Tardis USB hub, and even, http://www.entertainmentearth.com/prodinfo.asp?number=UTDR66 Tardis USB micro-fridge! I'm a Doctor Who addict, obviously. :)) I'm glad you're enjoying it. Yay Maddy! Keep warm in the Minnesota deep-freeze. I agree with Toni - next stop Torchwood. Oh, how good it is to see you blogging again. Chantrelle...are you okay after that fall. Toni is right. You MUST watch Torchwood. The SirCinch is for lunging, where the horse goes in a circle around you, and with this cinch, you can use 2 reins, helps him get his head down and in, and use his back and legs right. He doesn't need to lose weight, needs to gain it still. Just saw "The next Doctor" which I loved. I'm glad you're back on the air waves, Q! Watch more Donna episodes! "Turn Left" and "Forest of the Dead" especially. Catherine Tate was a fantastic companion. Vampi, you are evil. Arrgh. I just have to be contrary, but while i enjoyed watching torchwood, i do not think it's required aside form the eye candy aspect. i think the stories were a bit muddled. there was some brilliant, but not as evident as in dr who. Vampi, that was my impression when first watching Torchwood. I was expecting it to be more Dr Who-like and it wasn't. But it did grow on me and by the end was v glad I had watched it. And then there is the eye candy. I'm surprised you didn't get booties for Venus and Mim to go with the coats. Granted, they probably wouldn't approve of such things. Hurray for a working web site. Fruit and Nut Gift Boxes sound great. I think I'll be giving IOUs for gifts this year! I want a Tardis too! And a Sonic Screwdriver. Although right at this moment an orange juice and vodka Screwdriver sounds good too! Yay for the blog being back! And double yay for all of the Doctor Who? talk. I keep borrowing the DVDs from my little brother so that I can re-watch them. I like Torchwood, too, but I always seem to end up crying at half the episodes. I'd definitely take a Tardis any day, real, or, otherwise. You can get a tardis USB hub that lights up and makes the tardis noise on www.thinkgeek.com. I'm glad the site's back up! I've felt lost the past few days. I am very tired of cleaning. And, Serious Black got outside. I think he's on the roof. SO nice to have you back and the wee beasties in your life! I haven't seen any of them Dr. Who shows, so you aren't the last one! Does sircinch has anything to do with a surcingle? Long live the blog! The Internest is not complete without it. So Mim's not thinking here, "We are not amused" or "Get this off me @#%!^* now" or some such? I want a TARDIS toy, too. Tho' the dragonette has said in no uncertain terms that we should have a real one. Hurrah for Q's blog being back, and for Dr Who. I think if I could only have Dr Who *or* Torchwood, I'd go for the Doctor, but I do like Torchwood too. I was watching 'Turn Left', last night. One of my favourites. It took me a while to get used to Catherine Tate as companion, becuase she is a comedian and it took me a little while to get used to seeing her as a 'straight' character. Did I tick the box? Just finished my LAST final for the semester. Yay! Amanda Palmer & Jason Webley are coming back to the UK. Boo :-( sodding LiveNation/TicketMaster mean that (compulsary) "processing" and "delivary" costs add 60% to the costs of the ticket. (Particulalrly narked that hte only option for tickets is 'signed for' delivery at a cost of over £5 when (a) I don't belive it iwill be sent 'signed for', none of the other tickets I've ever bought from them have been, (b)Tehy will only deliver to the credit card billing address (which means if it *is* signed for, I will have to schlep down to the post office to get it, as I am never in when the postman comes and (c) Royal Mail charges 75p + normal postage for 'signed for', i.e. total postage coast will be max. of £1.14,(less, assuming they frank their own mail) yet they are charging £5.75 for this ON TOP of their booking/processing charges. Lys, how nice to see you here! Yay for finishing Finals. How long do you have to wait for grades to be posted? Thanks, DS :) Guess I missed most of the blog in absentia stress.... was worried at first when I couldn't find it. But luckily my mind was free to return to studying after Lorraine's Tweet led the way. Having said that, kudos to the Dr. ("That's WICKED, not WHO....there's a DIFFERENCE you little wankers") and Danth for getting all straightened out. Leaving it to the professionals--netwin! I really should be in bed, but Die Hard is on, and I can't miss listening to Mr Rickman. Marjorie! My sympathies (looks around for Vampi, who is no where in sight) --I have long disliked certain monolithic ticketing agencies for just such procedures. But it was the math final tonight. Three hours of heck on earth (not quite as bad as hell, but NOT FUN) wrapped up at the end by "oh, if you've were having trouble with questions one and two, don't worry about them. They were printed incorrectly and have no solution." That said, I *think* I've at least passed the class...and it should be posted by Friday at the latest. How's the weather over there, btw? Oooooh!! The Talented Mr. Rickman!! Sal, more dates coming soon, - looks as though there is amonth between NZ & London, maybe that's your chance? I wonder whether there will be any other UK dates, too - I decided to book London on the basis that Neither Jason Webley nor AFP came to Bristol last time. Lys, you'd think someone would've proof read the paper so they could warn you at the stat, not 45 minutes in - did they at least allow extra time for those who needed it? Fingers crossed you did OK.
You'd think that, Marjorie. But no. I think the only reason he mentioned it, was that there were five or six of us left as the clock was ticking off the final minutes....showing NO evidence of wrapping it up and leaving. The other 30-odd students having wisely written those questions off, no doubt. And it worked, sorta. The exam room emptied a whole ten minutes earlier. As you say, imagine if he'd mentioned it at the start--or even at the two hour mark! :) Oh well. So...someone convince Jason Webley of the lovely weather and gorgeous skies we've been having down here in New Mexico. I know LOTs of places that would no doubt be delighted to have him appear there! Must be bedtime here. Take care, you two!! Very happy to see the website again. Felt a bit adrift without it. Welcome back. Still sleepy, but I did pass on your comments to Jason and AFP, will let you know. I know they both believe that the people who come to their shows are the most important part OF their shows, and they can't like this gouging either. It's over 10! That means I do get to ride before work this morning. Ooh I haven't seen AFP or JW live yet, I wonder if there will be a Manchester date added. I'm tempted by the London one but it's only a couple of days before another Dublin trip to see Josh Ritter (again)...that might be too much gallivanting for one week and I'm doing my hardest to be restrained with gig ticket buying what with the prospect of house buying looming! Oh and just noticed the Magnetic Fields are doing a gig at Manchester Cathedral in March. Hurrah!! Your website lives! tho if it starts craving brains, i'd run! Of course not, Emily. Any group of people would be quite dull if every person in it did everything the same. :) And no one thing (show/ book/ subject/ etc.) is for everyone. You might be missing out on some fun, is all, if it's a show that'd be to your liking and you haven't seen it. A friend of ours bought Boyfriend a Dr. Who 3D model making kit last Christmas. So we now have a cardboard tardis, dalek, K9 and Cyberman head - as well as the remot control dalek I got him the year before - perched on top of one of our bookshelves! Yay for blog being back! And for weather being warm enough to ride in. I never got a hang of how to use the surcingle to get Amy to keep her head down. What if you combine Firefly's Mal plus Valentine and get Malentine? Mal means bad... so essentially you're still calling him Bad Romance? Congrats on finishing finals, Lys. The math man really ought to have let you know sooner if the test didn't print right. I'll join the group with EmilyOlive and Nathalie of people who've never seen Dr. Who. It's tempting me, though. If only to know what a Tardis is and why one might need one. well i can't comment too much as i don't know the details of the uk operation, i do know that all printed and mailed tickets are processed by hand. someone prints out each order, stuffs them by hand, and someone else verifies the order. as for the other fees, i can't really say much, you know how the internet is... hit me up in email if you want to know more. mal- also means simply "apple," as in Latin and botany, Malus being the genus name for apple trees, which in many pre-christian Western societies stood as a symbol of wisdom. Vampi, I wouldn't want you to feel I hold you personally responsible for their charging practices - It's just frustrating - especially when they appear to charge 2 sets of fees for the same thing. And MAgnetic Fields, too. I wonder if I can manage one of those gigs - any of them would need a day off work, 'tho..
Emily, you might enjoy Dr Who - dpesn't take itself too seriously, but I agree, we'd be very dull if we were all exactly alike, and until Dan manages to perfect the strretchy time, none of us has time to do everything..
Those of you with rela weather will be amused to hear that the BBC & Met Office are issuing severe weather warnigns, as temparatures of -4C and heavy snowfalls of "several inches" . . .
hee hee - and I'm thrilled that we're all the way up to freezing, with some blue in the sky. YIPPEEE!!! I started watching Dr. Who a few years back but lost interest because I started in the middle of a season and didn't know what was going on. But, now, through the magic of the internets, I've been watching back episodes and catching myself up. I enjoy British television. Especially The Thin Blue Line. I have long liked the idea of watching it, I must say. Hey, i didn't even realize I posted to the old thread. I read the new post and everything. Anyway...HI! and Ticky ticky!! Dump everything in a pot and bring to a boil. Reduce heat to low and simmer for 20 minutes. Scoop out half of the soup and blitz in a blender (or all of it if you don't want chunks). Top with more chopped cilantro if you want. Yum! This ends our special broadcast of Jess's Lunch. We now return you to your regularly scheduled blog. Forgot! Also a couple tablespoons of tomato paste. Vital thickening agent. Ben and hubby love tomato soup...that and tomato juice are the only 2 tomato things i can't deal with. Jess, that sounds delicious... and easy! is it just me, or all those wee red pointy hatted folk just a mite .... scary? Just me, I'm sure *jk*, Chantrelle! Though tis unfortunate that it kept him up overlong, I'm sure they all had a grand time. Cause we all do it, right? Threadkiller, that's me. Finally finished Finals (ooo, say that five times fast) AND GOT MY GRADE....and no one's about. Think I'll just nip off after some of Jess' soup....perfect for the day! You didn't kill it - your message just fell in the computer-free gap between leaving work and arriving home. Chantrelle - the kids look absolutely adorable. I'm done. *g* Yup, that Lysandwr...she's such a card. No wool over *her* eyes! This time I'm REALLY done! Have to go cook din now, and cut some meat treat for fleet feline feet. No math anymore; words now!! My math final grade has a pointy head. Yay! DS, if proximity is any guide the AFP dates for NZ are in the 12-17 March range. And I love Dr Who! Even if I did end up watching it from behind the couch when I was a kid. :) Sapphire and Steel was the one that really freaked me out though. Of course, I still loved it and insisted on watching it. Hmm...when I was working in libraries/archives we referred to those little roll-step stools as daleks. It caused much confusion with the office supply folk though. Maybe it's just a librarian/archivist thing? Congrats to Lys! That's just fabulous. Well done that woman! When I was little, we had a vacuum cleaner that looked very like a Dalek. I was petrified of it, and the damn thing lived under my bed. Nightmares abounded. Blackberry was down all day. Also very sad. Did errands with no e-mail. Warm today. Up to 23. Nice ride. I did get the most seriously WEIRD present from my Dad's wife, sent from both of them, by her. Didn't know what to do. Boss says to have a contest about it, so tomorrow we will. It will involve a FLOWERED mini dustpan, calculator, tape measure and dish brush. MATCHING FLOWERED mini dustpan, calculator, tape measure and dish brush. Um would it be evil if I sent *whatever it might be* to my father's wife? Now see, those sets are handy when you have someone in your home who loses your tools, or damages them, and who wouldn't be seen dead using something covered with flowers. Somehow, I don't see you having that problem with The Bengal Alliance. Good that it is opening so quick down there, rather than the huge delay between opening here and then other countries which seems normal. Yes, I expect so Lys, as long as the kids don't try and drink huge buckets of coke. It's the calculator I find baffling. Perhaps you're meant to build something with the other three items? Like a miniature trebuchet or something. In which case you'd use the calculator to work out your angle and torque. Flowered tools huh? Sounds like what my friend's sister gave her a couple of Christmases ago, thinking that if the hammer had a floral handle, the boys wouldn't nick off with it. Ooh...it's just occurred to me. The calculator and the tape measure are to work out the trajectory for the plates you'll throw on the floor when you see your gift. The dishbrush is so you'll throw clean plates on the floor (ok, that's stretch), and the mini dustpan is to clean up afterwards (they're very small plates). Oh dear. Must be nearly time to go home. Speaking of upcoming movies, I saw an ad today for Terry Gilliam's "The Imaginarium of Doctor Parnassus," at last, at last! Starts 25 December some places and 8 January "everywhere." In North America that is. w00t! Lys, high five re: the pointy-headed letter grade! Yay for Lys being so clever and edumacated!! Wonder it your dad's wife is related to my (elderly) 2nd cousin. She gives very odd gifts. One year, we had an 'identify this item' game. We still don't know what it was intended to be, but we had a lot lot of fun speculating, and the winner ended up with a lovely new, er, thing. I have not been snowed on (yet) but it does feel awfully cold. Just back from seeing Avatar. WOW. I feel much like I did when I walked out of seeing Gallipolli (heck, was it really 1981?) fury at stupid military invasions/decisions. None of the kids needed to run to the loo in the middle of the film - just me. Ahhh, middle aged bladders. Tho I do want to say this: Fiends (or so it seems to me) tend to be a *very* clever..often wise....all around smart sort o' crowd. If I ever come across all proud about school...final..or a grade..it is *only* cause, frankly, I have to work SO darn hard for every bit. So I hold them tight w/both my grubby paws and shout yeah hallelujah! It is a process. Still learning my good manners at this banquet (this CORNUCOPIA!!) of higher learning--the whole ravenning attack, trying to devour every bit o' information in my path, thingie was getting a scosh uncivilized. ps.....Chantrelle--you haven't mentioned the hand/wrist recently. I trust it is well? DS--Really looking forward to seeing Avatar. Were the visuals actually as amazing as "everyone" says they are? You bet Lys. Only the second 3D I've seen (the other was Coraline) and it was stunning. I may just go and see it again! I was just reading the WIRED articles this week, where they spoke of all the technology they had to develop to be able to start filming that thing and it sounds amazing. really? I'd like to read them. Are they online? Wait! Have you seen Capt. Jack!? The man is amazing! 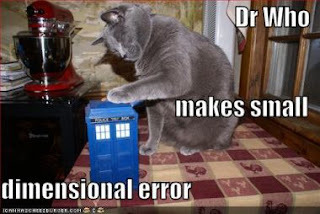 And huzzah for animals, but I'm now in a giant Doctor Who fixness. I read them in the paper magazine but I am happy you could found them on line as well. Their refinement of the 3D process explains why I didn't come out with the same headache as I did after Coraline, even though Avatar is longer. Lys, we are all thrilled for you, and pointy-headed grades are an achievement! Not that I know everything (or anything, necessarily), but I do have lots of experience with academia - if you ever want to ask anything, give me a shout (my email is plastered all over the internet!). Today is so very not my day, and it isn't even 9am yet. It's the dark season, eating the light out of the world. Thanks goodness, around Giftmas, it gets sick with too much of it and returns it to its proper place. There is no light, and yet I am not allowed to crawl into bed with a book, huddled under my new down comforter with the cat, and stay there until the sun comes out. I just got King's Under the Dome, and judging by the size it may just last me that long. Well, done, Lys, and I, for one, certainly am delighted by your pointy headed grade, and would be sad for false modesty were to prevent your pleasure here! The masterful puns get a groan, as well. As I sit at my computer, there's a wren on the wreath hanging outside the door (visible through the window) eating the holly berries. My solitary holiday decoration thus far is a hit! And I've been meaning to thank Adriandalen and Jess for their cards. Love that one was a lovely fantasy illustration (from an artist I didn't know!) and the other Gorey. Made me smile a lot. Lys that's really good, but don't you think it could have been better if you had applied yourself???? I slay myself some mornings. The flowered things weren't a lovely gift set of Lady Tools, they were the sort of thing one would grab at a dollar store. Well, at 7:33 AM the sun has been up a bit less than 30 minutes here, plus this morning's temperature was at 34 F/just above 0 C. Granted, on school days I get up at 5:30 AM, so it's usually dark when I get up. Doesn't mean I don't go back to sleep once the girls are at school. ::sigh:: Right now I need to go do more laundry. YAY LYS! I don't think you give yourself enough credit. I'm sure that if I went back to school I'd have to work harder for one of those lovely pointed-headed grades. Besides, learning/education is not limited to a classroom. Good Morning Lorraine. Missed you while the blog was down. I didn't figure out the-follow -the -email-link bit, so you were gone for a lonnng time. Watched a show called Castle last night, with Nathan Fillian (sp?) Cop/detective drama with Natan as a mystery writer main character... not Firefly, but not bad either. I can't get into Castle, even though I really want to like it. :( I did see a movie with Fillion in it recently, though. It's called Outing Riley, and it's about a Catholic who comes out to his Irish family. Fillion plays one of the brothers. It was pretty funny, and Fillion was pretty good in it. I saw one episode of Castle, apparently a very bad one, and haven't been able to get into it either, sadly.. I am going riding now before I give in to what I want to do which is back under the covers. Seems to be all foggy outside. Nice inside. Like it here. Sally, the headache from 3d generally comes when the projectors aren't aligned just right. Lys, those were fabulous grades and you should be shouting from the tops of mountains about them. Marjorie, know you weren't blaming me, but there is so much about my job i won't share on the internet, especially now with the whole merger thing. Quick skim to catch up. Oh, Lysandwr, get thee to a punnery! But go ahead and celebrate those pointy-headed grades while you're at it! The hard-won ones mean so much more. Oh, wow. Thanks, guys! blush You're all so darn Nice! BLISS! After the utter madness of the last day at work, I am finally on holiday! I want one for my future Spooky-esque apartment. The librarians and I had the most marvelous Christmas feast from a local Asian restaurant. Then ice cream cake afterwards. It was absolutely blissfully incredible. And I've hung the festive bunting on my porch rail! \o/ Wooo, party. I want ice cream cake. FOR DINNER. And I am having whisky. How decadent. How lovely. How zzzzzzzzzzz inducing. All my mad day hype is folding back on itself like some sort of collapsed soufflé. "Whiskey & Bunting" would be a good name for a tv cop show. Is bunting something you can nibble upon? I feel nibbly. Oh lovely, blogger just ate my comment. I have a piece of chocolate cake here at work with me, and there's ice cream in the downstairs freezer. I've been waiting for just the right moment, and it seems to be rapidly approaching. I finished my seminar just in time to give it this morning, and it turned out not to be too long, quite. My boss walked into the breakroom while I was making tea beforehand. "I won't be at your seminar. I need to go Christmas shopping." This is an in-house seminar series so that all of us know what the other scientists are doing. And this is the boss that has told me he has no idea what my research is about. Sounds like the Peter Principle in action! Another interview for my clerical job opening. Then off to introduce my friend and colleague to the wonderful world of Star Trek. Poor guy has missed out entirely. He's only a year or so younger than I am. This lack of geekiness in a cataloger cannot stand. But I do seem to remeber that you said you had a useless boss. A clear proff of this, then. Definitely a boss to inspire you. Inspiration? Is that what I feel??? Nathalie, you're thinking bundt cake. Festive bunting is this sort of stuff. Technically I'm hanging piney garlands, not bunting. But I like to say "festive bunting". Apparently this is also a festive bunting. I call it scary. Isn't a bunting also a birdie? Jess - sent you a DM in Twitter with address. The One Eyed Jacks, two Bengals who have been waiting forever for a home, have found one! They just need a ride to get there.